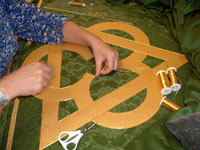 As suppliers of fine quality textile appointments since 1789, Wippell has enormous experience in handling all sorts of fabrics, trimmings and embellishments, which illustrate the various symbols that convey the message of particular liturgical seasons. In turn, we pass on the stewardship of these various pieces to the altar guild team, who care for them in a most generous way, knowing the responsibilities involved in preparing the space for worship. A representative of Wippell for 36 years, I’ve been privileged to see an abundance of textile appointments across the land. Some have evoked gasps of joy and others, well, other comments… I’m sure we all recall the odd bits and pieces that sit in the closet, never to see the light of day for very good reason! Still, these are very much in the minority. In general, the appointments are superb. They were carefully and thoughtfully considered in the first place. These glorious pieces provide a visual link throughout generations as they are witness to the milestones of life, from baptisms and confirmations to ordinations, weddings and funerals. Cleaning and maintaining textiles can be challenging, particularly in the case of larger items, such as a funeral pall, altar frontals, pulpit and lectern antependia, and veils and burses. The range of English fabrics includes rayon/viscose, viscose and cotton, silk and viscose, tapestry and the finest quality Irish linen. We always suggest checking directly with the manufacturers for precise cleaning instructions in the absence of a cleaning label. Often such a label is not included because of the precious and decorative nature of the piece, and only the manufacturers would be confident in advising such information. Dry cleaning is the norm for vestments, and we would encourage cautious investigation as to which cleaners would be the most suited for this unusual application. It is important to engage cleaners that are well versed in dealing with precious fabrics and who will take the time to pay attention to its unique needs and handle the piece with the due care they deserve. Vestments should be cleaned promptly rather than allow dirt and grime to embed itself into the fibers. Many are manufactured with multiple layers of fabric, including linings and interlinings, orphrey bandings of varying fabrics, as well as symbols and decorative features. It is impossible to thoroughly clean such items with traditional dry-cleaning because each of the components “move” at a different rate depending upon texture, humidity, etc. You may have noticed the occasional buckling of fabric because of this. Our suggestion is a combination of lightly vacuuming and, if necessary, spot cleaning the surface fabric in the event of a problem — with caution and without an attempt to be too enthusiastic and diligent in trying to clean such pieces. They are creative works of art and, as with any other canvass of art, should be respected. In the matter of old embroideries, silk threads often become stressed through the years. Silk is a natural product that will dissipate in the fullness of time. However, many forms of embroidery, including the machine embroideries of today, use yarn that includes other fibers that stabilize the embroideries so they can last much longer and be less prone to wear and tear. Indeed, Wippell often transfers existing embroideries that are in suitable condition onto a new fabric base, renewing the couching around the edges with appropriate threads. We can thereby give a new lease on life for what is oftentimes an exquisite embroidery of yesteryear, one worthy of sharing its new life as it once again becomes part of the worship space and a visual feast for generations to come! The photos accompanying this article show this process and convey the expertise involved in such work. The first shows transferring hand embroidery en block, the other the renewal of a hand-appliquéd Trinitarian symbol for an altar frontal that was originally created in the mid-sixties. Some fabrics are light-sensitive and will fade in certain conditions, such as strong sunlight. Fabric colors can run if they get wet (yes, we’ve experienced such stories as a cope caught in a downpour! ), but generally that’s not a problem we face. Fabrics are carefully considered by the manufacturer at the outset for their particular application. From my experience, most vestments are stored on hangers in closets. While this is fine, beware of the type of hangers used; they should be carefully chosen. We are currently investigating a hanger with no pointed edges to stress the fabric. Indeed, I’ve seen many vestments damaged simply because the hangers create the dented “ears” that eventually show wear. Using a hanging storage bag will protect precious fabrics from dust and critters. If you are fortunate enough to have a vestments chest where items can be stored flat, this is ideal because there is no stress at all on the fabrics. However, it is always a good idea to line the drawers with acid-free tissue paper and to cover the vestments before closing the drawers. Altar linens, of course, are under constant care, and I see these carefully and dutifully pressed and folded in accord with how they should be used or, in the case of the altar cloth, wrapped around card rollers, all fresh and ready for the next time. Larger items such as altar frontals and funeral palls require careful consideration. Many churches have proper storage chests that keep the frontals perfectly flat, suspended from a rod at the top that simulates the altar. However, if other storage means are necessary, a triple fold is acceptable, making sure there is no crease dead center. Usually this is where the symbol is placed and under no circumstances should any embellishment, whether it is embroideries or orphreys, be subjected to any fold. High humidity can also be a problem. Stabilizing humidity in the sacristy at a moderate level will provide an ideal setting for all your precious pieces. In summary, these works of art need to be dealt with carefully and with the absolute minimum of cleaning. They represent not only a substantial investment, but a legacy, a memorial or thanksgiving gift that should be honored. What a joy and privilege it is to minister in such a way to the Glory of God! To our friends of the National Altar Guild Association, peace and joy!